It's a tale as old as time, that Hollywood studios release full glamor shots of their suited superheroes just before set photos leak the look in a much less flattering light. 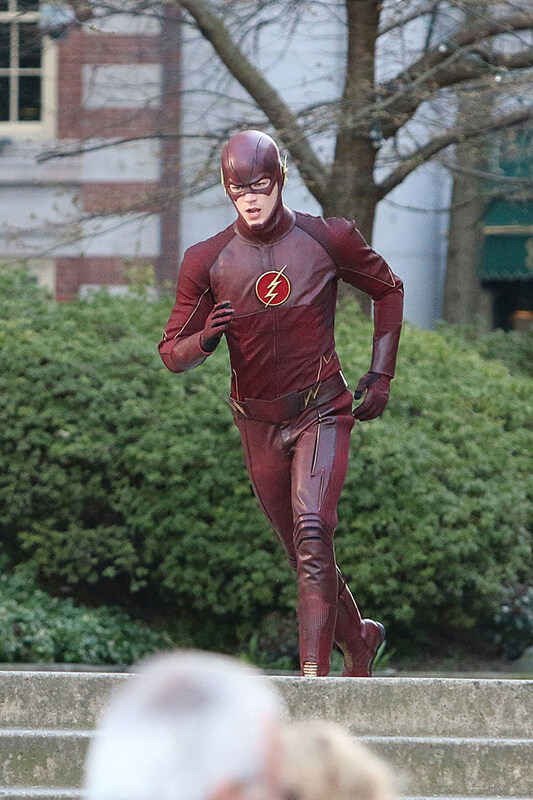 So too is it with The CW's 'Arrow' spinoff 'The Flash,' which yesterday gave us a supercharged look at the Scarlet Speedster, before much more detailed photos of Grant Gustin's costume in broad daylight have emerged from the Vancouver set! 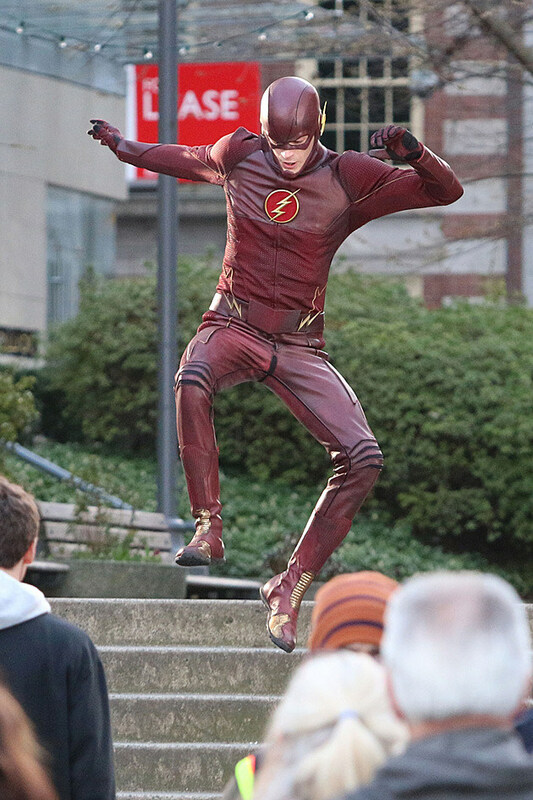 The low lighting of the initial CW shots featuring Grant Gustin's Barry Allen suited up as his Flash-y alter ego obscured a few of the finer details, but with 'The Flash' itself something of a tonal contrast with the darker 'Arrow,' photos from the Vancouver set put the Fastest Man Alive right there in broad daylight. The suit looks more functional than fashionable, with more breathable running fabric in place than the muscled 1990 version, with even a few appreciable aspects of Oliver Queen's 'Arrow' outfit on display. Designed by Oscar-winning designer Colleen Atwood (Tim Burton’s ‘Alice in Wonderland’, ‘Snow White and the Huntsman’), the suit does have bit of gold accent to the boots after all, along with a few more lightning bolt designs on the belt, and seams running through the costume. Gustin was seen to be running and jumping throughout the shoot, though it remains unknown exactly how special effects will bring 'The Flash''s super-speed to life. Additionally, Danielle Panabaker will play Caitlin Snow, a highly intelligent bioengineering expert who lost her fiancé during an explosion at S.T.A.R. Labs and is an incarnation of DC villain Killer Frost. Original ‘Flash’ star John Wesley Shipp has signed on to the ‘Arrow’ spinoff, as well, though producers aren’t divulging the details of his role just yet. 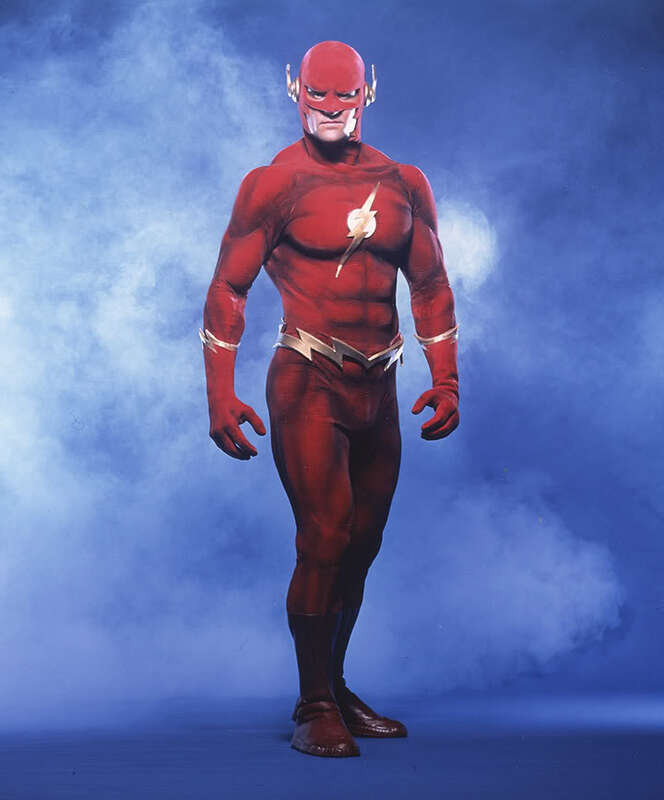 You can check out a few new photos of 'The Flash' costume below, along with a set video of Gustin in action, and tell us in the comments if you like the new look of DC's beloved speedster in his CW incarnation!